In Part 1 of this series we created the required Roles, Profiles and Class as collections within SCCM. In this next post, we’ll create a web service which queries SCCM and then creates ENC compatible responses, which can then be consumed by Puppet. An external node classifier is an arbitrary script or application which can tell Puppet which classes a node should have. The script or application is executed in the master during operations such as catalog compilation. Some ENCs can be complex scripts written in ruby or python, or can be as simple as using curl to query a web service; which is what we’ll be using in this post. Note that the ENC script itself will be very simple and have no ability to recover from errors or retry if there’s a network failure etc. When the ENC script is executed, the only parameter is the node name, typically the fully qualified domain name (FQDN) of a node. ENC expects a YAML document to be returned by the script, or nothing. So how do we get the information needed to populate the YAML file? SCCM uses a rather large MS SQL Server to house all of the required information, so for the most part it’s just a case of navigating the database schema. So for our SQL query we need to find all of the collections a system (Puppet Node) is a member of, given a system’s FQDN. Once we have the collection list, we can use the collection names to populate the YAML response. The names that are prefixed with v_ e.g. v_FullCollectionMembership are actually Views, not Tables. The SCCM database schema makes heavy use of views and should be used in preference to querying the SCCM tables. Mainly because it’s generally faster and easier to understand that the raw tables. Seriously, have a look at the tables in SCCM! Crazy! This view has the discovery data for each system in the SCCM Datbase, in particular it has the FQDN of the system and its ResourceID. All resources, User and System, are referenced by it’s ResourceID in foregin tables. As the name implies, this view is a simple list of CollectionID,ResourceID pairs. The CollectionID is uniqueID of a collection and is used in foreign tables such as this. This view holds basic information about every collection. In particular for us, the Name and CollectionID of collections. As this is a proof of concept, we can quickly create a Web Service using Powershell. This isn’t as crazy as it sounds as Powershell has the full power of the .Net Framework at its disposal, including the System.Net.HttpListener namespace. A great example can be found here and was used as a basis for our script. So our webservice is going to receive the system name as part of the URL e.g. http://localhost:8080/WINDOWS001.sccm-demo.local. This will make it easy to query from the Puppet master and easy to diagnose. Note that I’m using HTTP as the transport, not HTTPS. This was just to make it easier to write this script and show how you quickly you can create a proof-of-concept web service in Powershell. If you are thinking of using this yourself I would recommend using a more rebust web server and language e.g. ASP.NET on IIS, and use a more secure transport, such as HTTPS with both client and server certificate validation. The information that is transferred by an ENC could be very handy for nefarious purposes! Get-NodeResponse is the main function in this script and takes an input of the computer query and will output a YAML document as a string. Firstly it creates a database connection and creates the SQL query we’ll against the database.
" 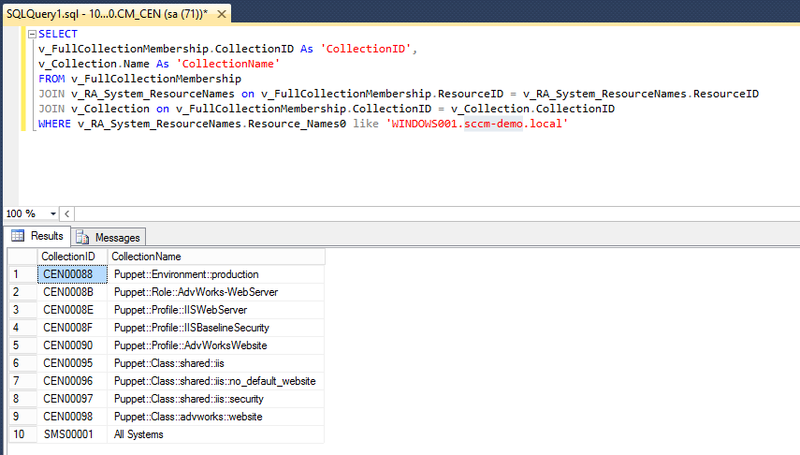 WHERE v_RA_System_ResourceNames.Resource_Names0 like '$($NodeName)'"
Now we know the collection name we can use simple text comparisons to classify the collection as an Environment, Role, Profile or Class. We then build up a list of all of the types of collections. The enviornment collections are special. As there can be only one environment, we only care about the last environment name. This could probabyl be tested and throw an error if multiple environments are assigned; much like the Roles. Write-Verbose "Found Environment collection $collName"
Write-Verbose "Found Role collection $collName"
Write-Verbose "Found Profile collection $collName"
Write-Verbose "Found Class collection $collName"
Write-Verbose "Unable to find any environments"
Write-Verbose "Node is a member of more than one role"
Now that we’ve passed the sanity checks we can build up the YAML document. All of the Class collections are enumerated and appended to the classes: section in the document. Finally the environment is appended to the end. There is an all encompassing try-catch block, which in the event of error just returns an empty string. The remainder of the script is the web service. First we check that we can connect to the database and then create a System.Net.HttpListener .Net object which will run our web service. The listening URL is important as the web service will not respond to different URLs e.g. if you specify http://localhost:8080 then you won’t be able to access the webservice using http://computer.domain:8080. The default is to respond to any request on port 8080.
throw "Error while connecting to the Database"
The web server is a simple loop which waits for a connection, extracts the computer name from the URL and then returns the response from the Get-NodeResponse function. It also returns simple HTTP error codes for bad requests or server errors. One problem with this setup is there is no way to break the while-loop because the function to wait for connections is blocking. To get around this, we add a route for http://<host>/kill which will exit the web server. Write-Verbose "Request: NodeName = $computerName"
In Part 3, we’ll configure Puppet to use our ENC web service and then try out some node classifications for real.